How will democracy end? And what will replace it? A preeminent political scientist examines the past, present, and future of an endangered political philosophySince the end of World War II, democracy's sweep across the globe seemed inexorable. Yet today, it seems radically imperiled, even in some of the world's most stable democracies. How bad could things get?In How Democracy Ends, David Runciman argues that we are trapped in outdated twentieth-century ideas of democratic failure. By fixating on coups and violence, we are focusing on the wrong threats. Our societies are too affluent, too elderly, and too networked to fall apart as they did in the past. 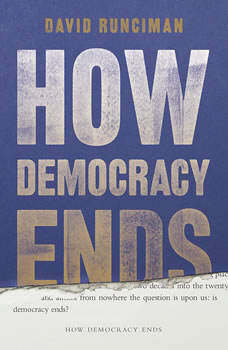 We need new ways of thinking the unthinkable--a twenty-first-century vision of the end of democracy, and whether its collapse might allow us to move forward to something better.A provocative book by a major political philosopher, How Democracy Ends asks the most trenchant questions that underlie the disturbing patterns of our contemporary political life.